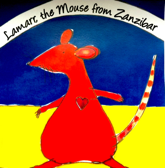 Thus begins Lamarr, the Mouse from Zanzibar. On 25 September 2011, I read parts of this story to friends and family who had gathered in Utrecht. For this occasion Ella Steenmeijer, a gifted artist, had made 22 illustrations, as well as three excellent paintings. The 25 copies we had printed for promotional purposes were all sold – though I’ll admit my mother bought more than one. Still, such a beautiful afternoon! We’re certain we’ll find a publisher for this sort of thing, one day. On the other hand, not having found one has never in the least discouraged us.